I am a hard-core cheesecake lover. They opened a Cheesecake Factory Restaurant (hooray!) about 20 minutes from my house and last Saturday my husband I decided to go try it out. We had some friends arrive a couple of minutes before we did to put our names on the waiting list (it was around 5 pm on Saturday night) . . . the wait for a table was over 2 HOURS long!! I love cheesecake, but I wasn’t sure I could wait TWO HOURS for some. So, we ate at a delicious Mexican restaurant and I came home and made my own cheesecake. 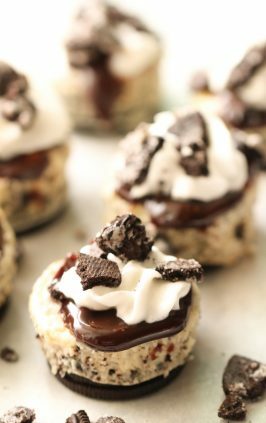 The thing that I love about this recipe is that it can be cut into little tiny bite-size pieces. 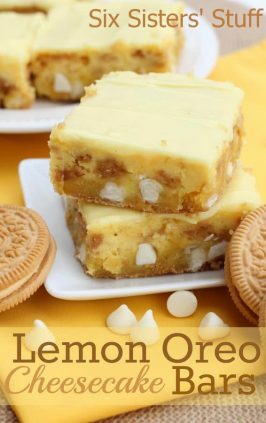 For some reason I don’t feel as guilty when I pop about 10 of these little bites into mouth as compared to sitting down and devouring a huge piece of cheesecake (even though I have a feeling they equal out to be about the same amount). 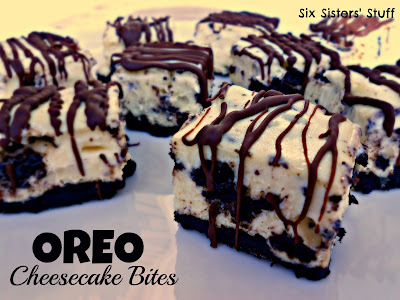 Oreos and cheesecake together? That is my idea of HEAVEN! Line a 13x9" baking pan with foil, with ends extending over sides. Finely crush 24 cookies (I placed them in a Ziploc bag and crushed them with my rolling pin). Melt 1/4 cup butter; mix with crumbs. Press onto bottom of prepared pan. Beat softened cream cheese and sugar with mixer until blended. Add sour cream and vanilla; mix well. Add eggs, 1 at a time, beating after each just until blended. Chop remaining 12 Oreo cookies. Gently stir into batter; pour over crust. Bake for about 45 minutes or until center is almost set. Let cool (I stuck mine into the fridge for about 2 hours). After the cheesecake has cooled down, microwave chocolate in a microwaveable bowl until melted (follow directions on packaging); stir until smooth. Use foil handles to lift cheesecake from pan and cut into bite-size pieces. Place on baking sheet covered in wax paper. 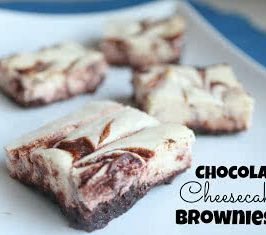 Drizzle melted chocolate over each piece of cheesecake using a spoon. Stick in the fridge until chocolate has hardened. What is chocolate candy coating? My guess is chocolate chips or bar to be melted and drizzled? I just wanna make sure cause they look amazing and I cant wait to give them a try! Oreos and cheesecake together. Yummy!! Thanks for sharing a great looking recipe, will have to try this. 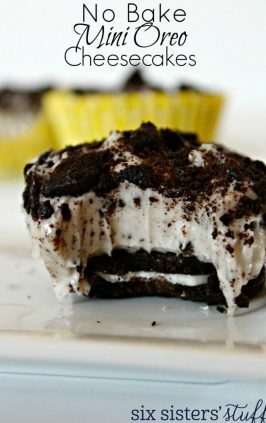 A new way to eat oreo's and cheesecake. I am going to try this. Cheesecake Factory is well worth the wait...can you tell it is my favorite restaurant? 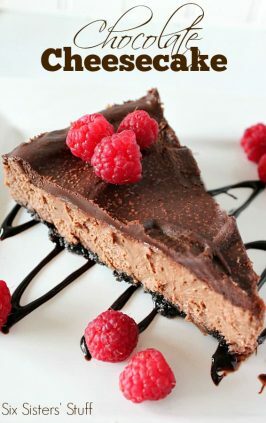 :-) Although I don't enjoy paying that much for their cheesecake when you can make one just as good at home!! Love the little mini bites of cheesecake love!!! Ohh that looks so good! 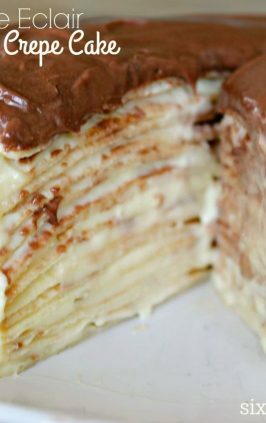 Its not on my weight loss goal menu but I would love to try it. I tried these. They where great except the consistency was weird. Not sure if they cooled to quick. The top was gummy. But, all in all it was great. I made these twice now and am preparing to make them again for NYE. They have received rave reviews every time. Thanks for the great recipe! 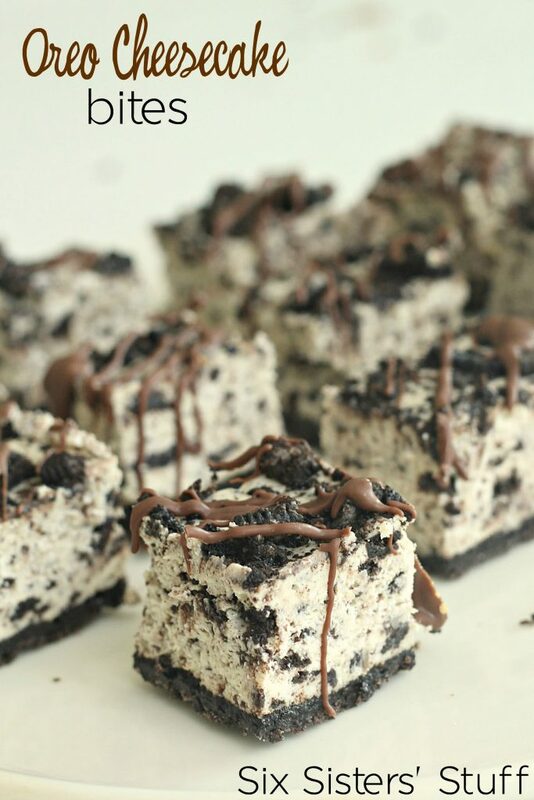 How long can you keep the oreo cheesecake bars in the fridge and do they keep well? They really don't last long around our house! But they should be fine in an airtight container in the fridge for 3-4 days. I know this is a dumb question but when the recipe calls for 36 oreo cookies divided am I removing the cream filling and the 2 sandwich cookies count as 1 cookie? 36 (72 individual wafers) cookies are in a standard pack. Divided means that you use 24 cookies in one part of the recipe, and 12 cookies later in another part of the recipe. Together they total 36 cookies. Hey there! Can I make this and freeze it the night before and pull ot out a couple hours before eating or would this ruin its consistency when thawing? I was honking freezing it would keep it more firm. 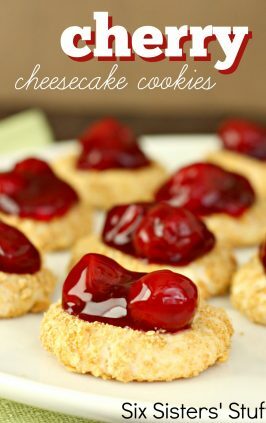 These cheesecake bites can definitely be frozen.